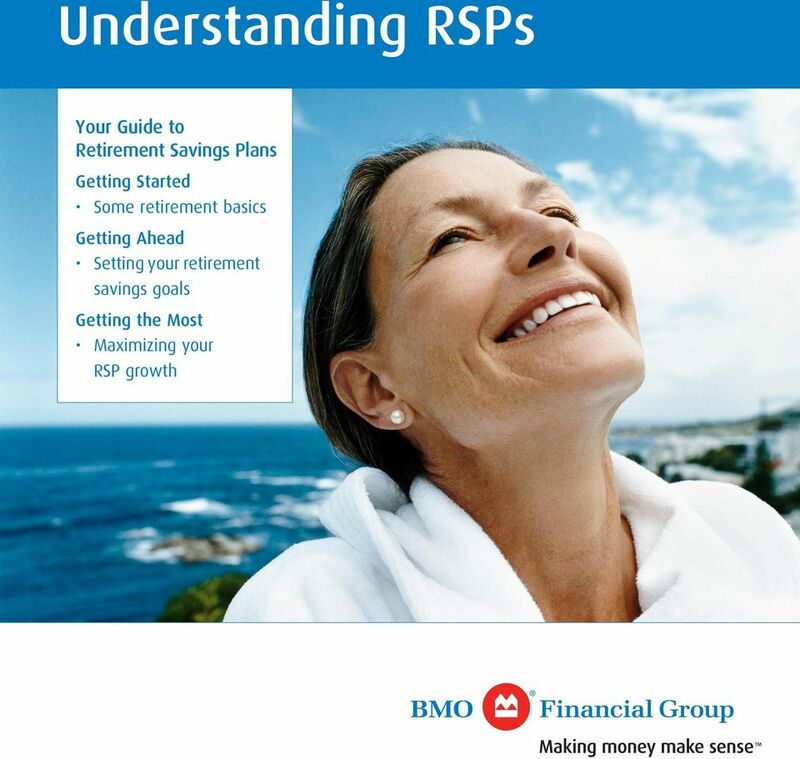 Download "Understanding RSPs. 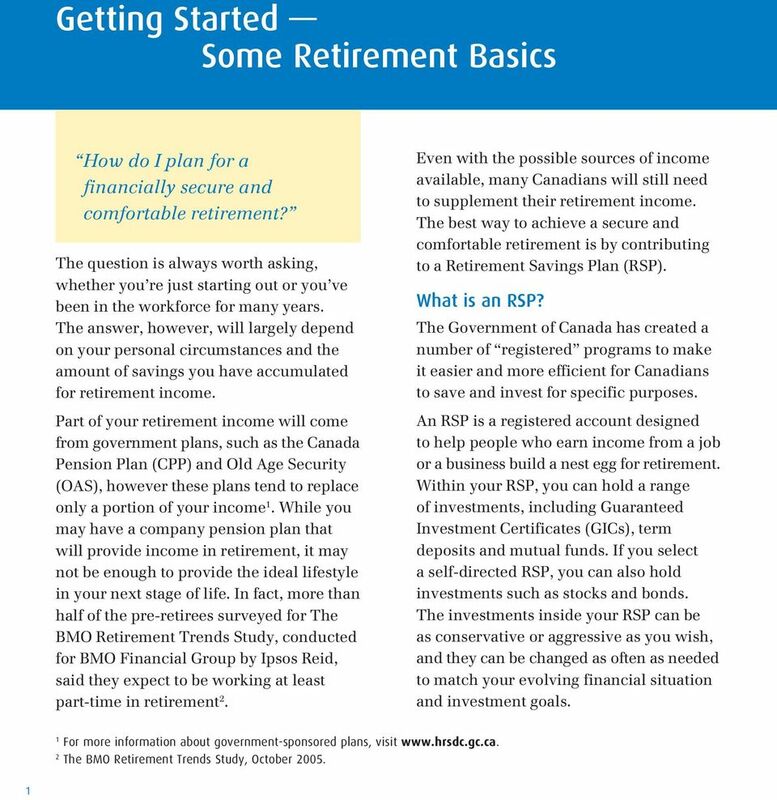 Your Guide to Retirement Savings Plans"
15 BMO Financial Group provides this brochure to clients for informational purposes only. Professional advice should be obtained with respect to any circumstance. 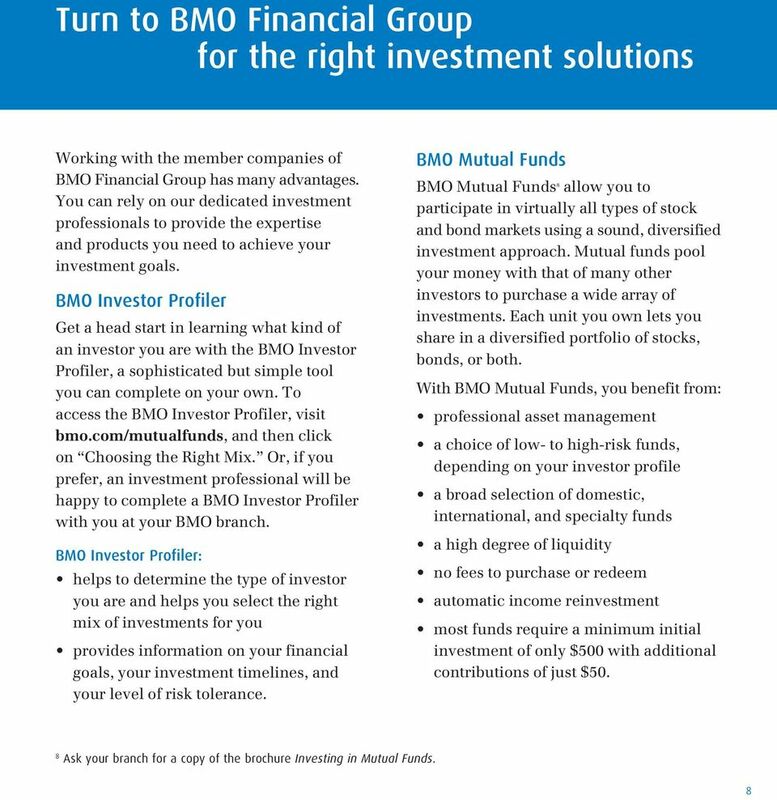 BMO Mutual Funds and BMO MatchMaker Portfolios are offered by BMO Investments Inc., a financial services firm and separate legal entity from Bank of Montreal. 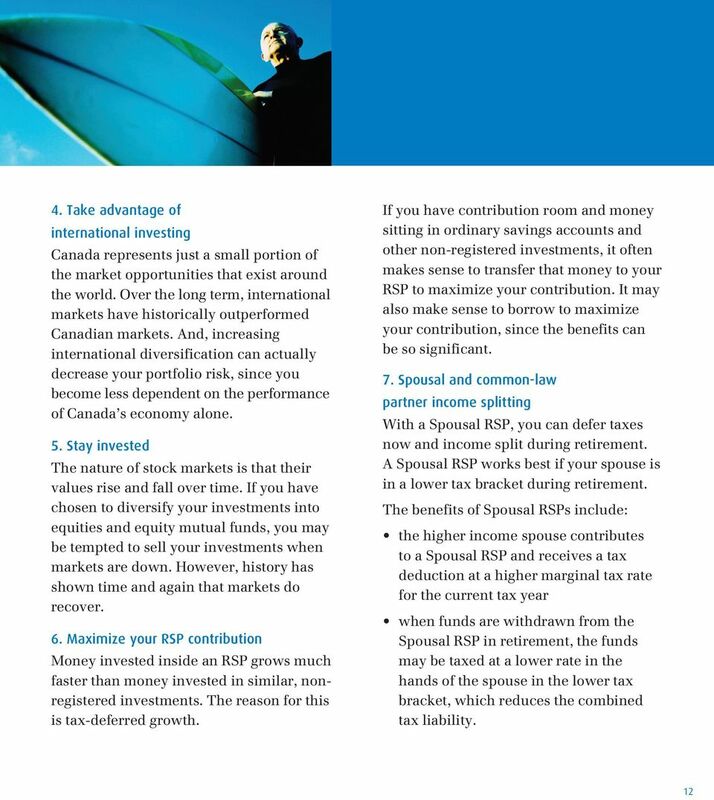 Commissions, trailing commissions, management fees and expenses may be associated with mutual fund investments and the use of an asset allocation service. 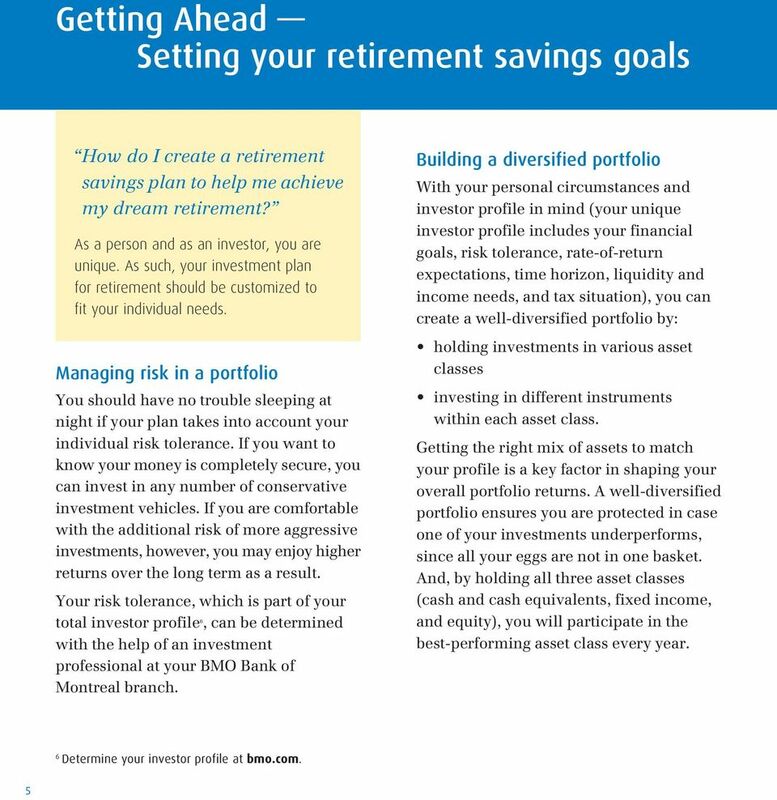 Please read the prospectus of the mutual funds in which investment may be made before investing, including mutual fund investments under an asset allocation service. Mutual funds are not guaranteed, their values change frequently and past performance may not be repeated. /TM Trade-marks of Bank of Montreal, used under licence. 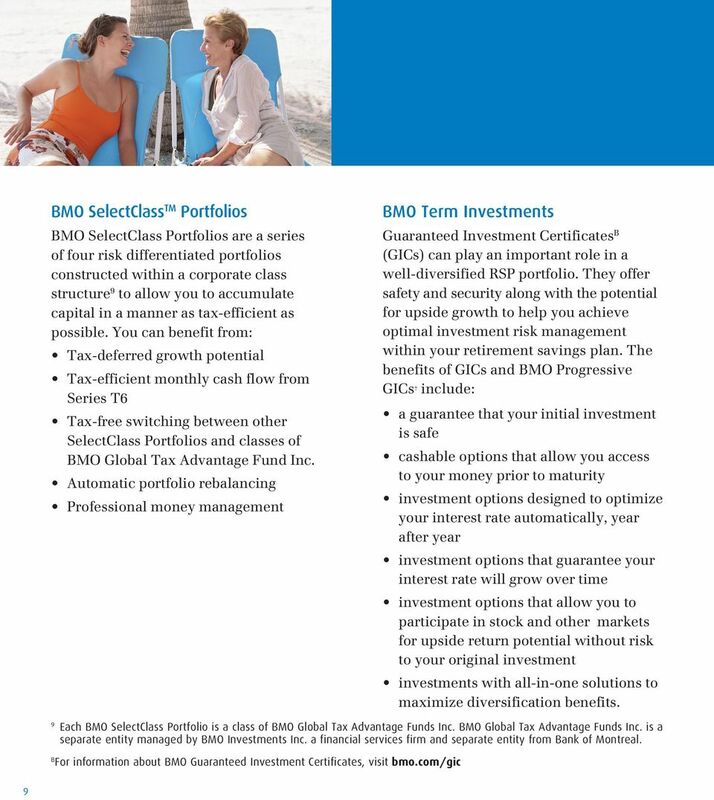 BMO GICs are issued by Bank of Montreal Mortgage Corpo ration and unconditionally guaranteed by Bank of Montreal. 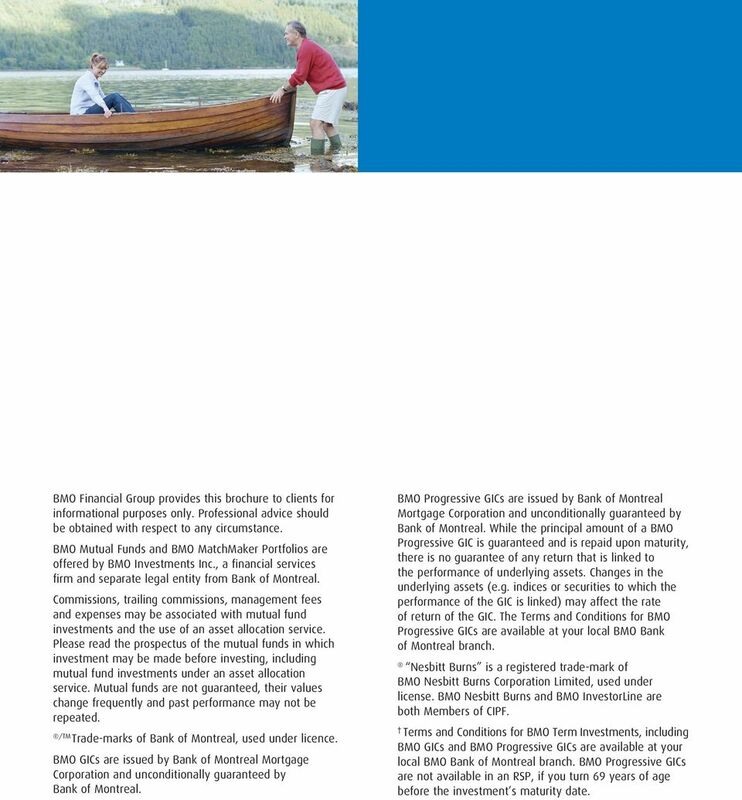 BMO Progressive GICs are issued by Bank of Montreal Mortgage Corporation and unconditionally guaranteed by Bank of Montreal. 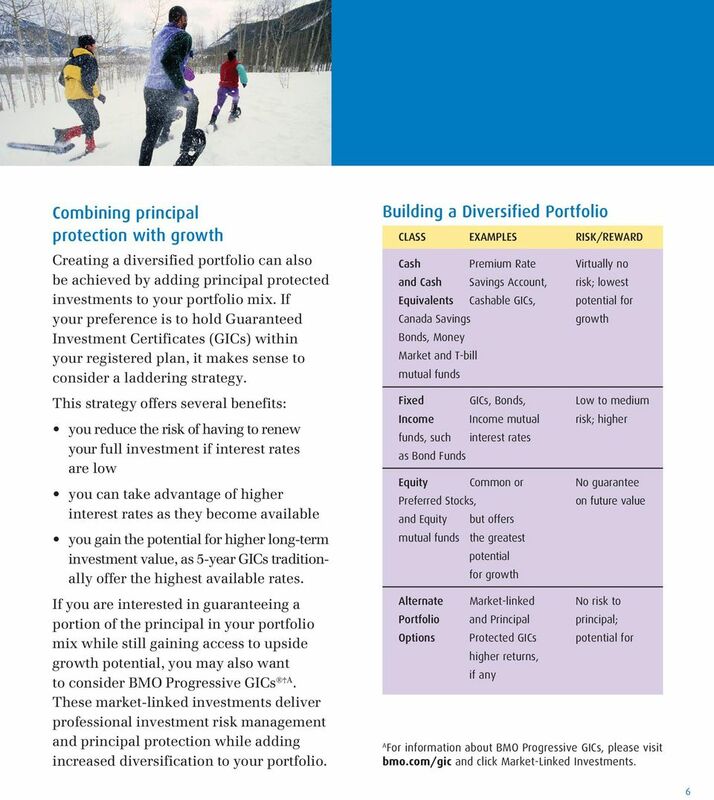 While the principal amount of a BMO Progressive GIC is guaranteed and is repaid upon maturity, there is no guarantee of any return that is linked to the performance of underlying assets. Changes in the underlying assets (e.g. indices or securities to which the performance of the GIC is linked) may affect the rate of return of the GIC. 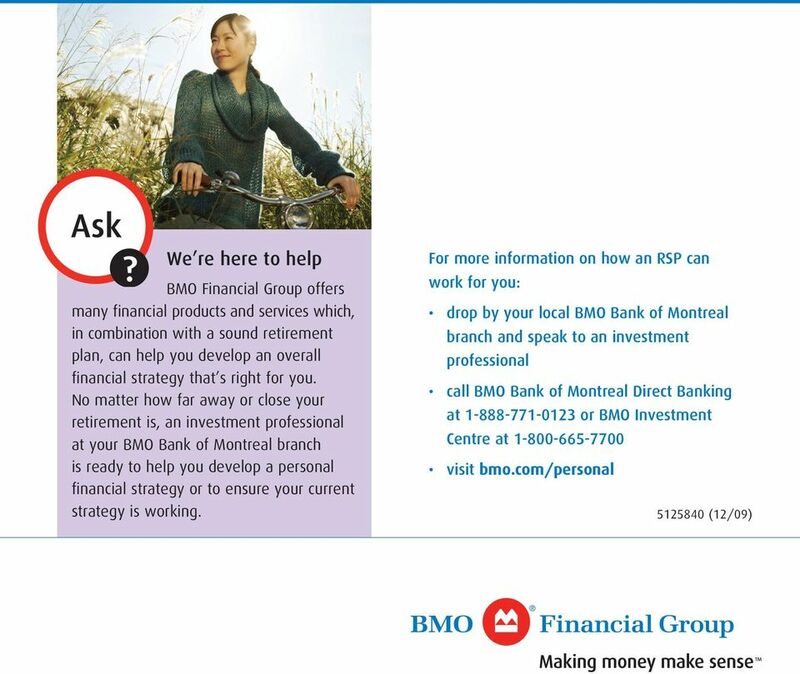 The Terms and Conditions for BMO Progressive GICs are available at your local BMO Bank of Montreal branch. Nesbitt Burns is a registered trade-mark of BMO Nesbitt Burns Corporation Limited, used under license. 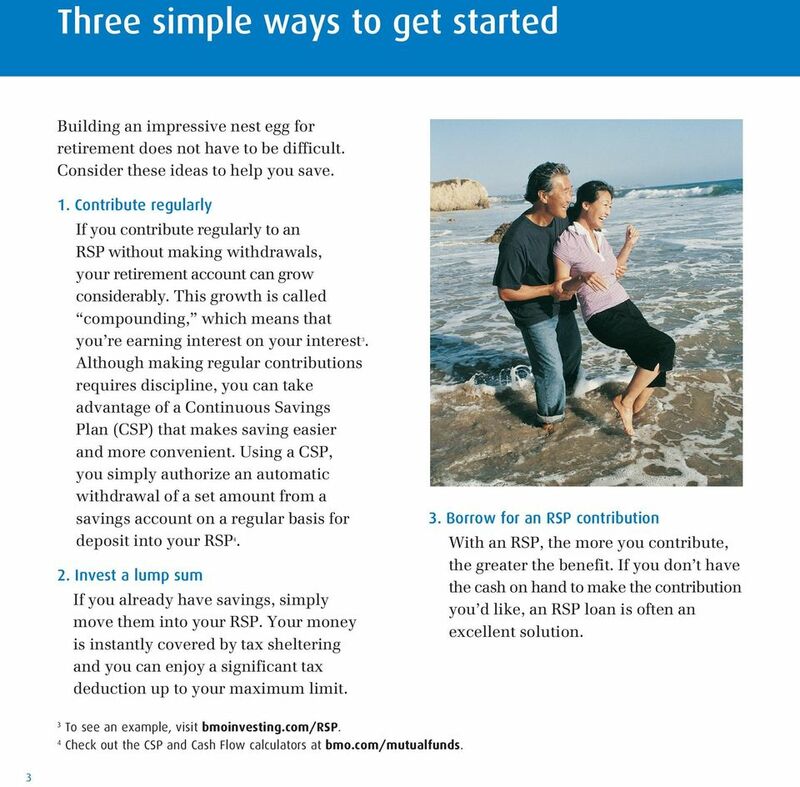 BMO Nesbitt Burns and BMO InvestorLine are both Members of CIPF. 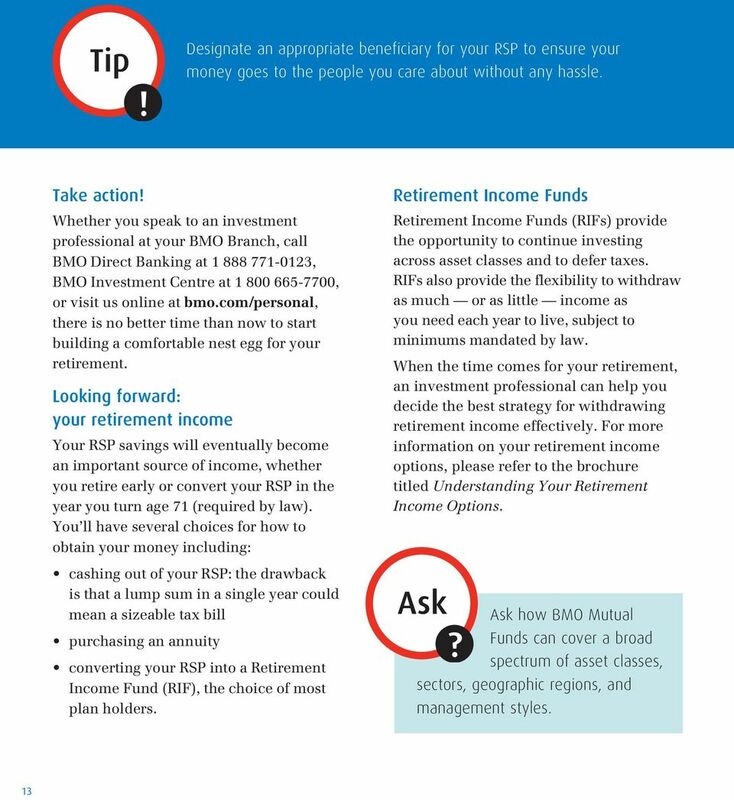 Terms and Conditions for BMO Term Investments, including BMO GICs and BMO Progressive GICs are available at your local BMO Bank of Montreal branch. 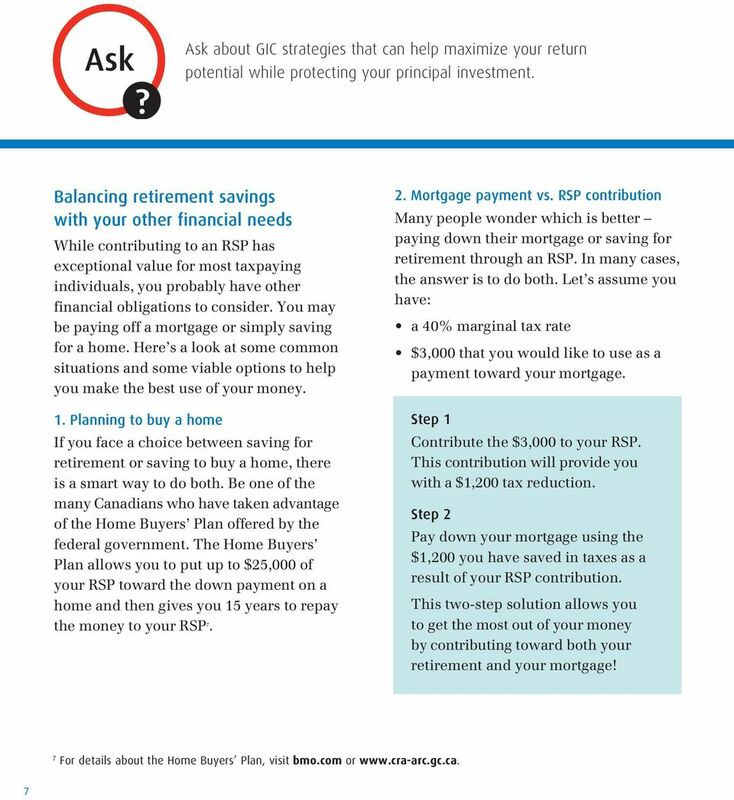 BMO Progressive GICs are not available in an RSP, if you turn 69 years of age before the investment s maturity date. 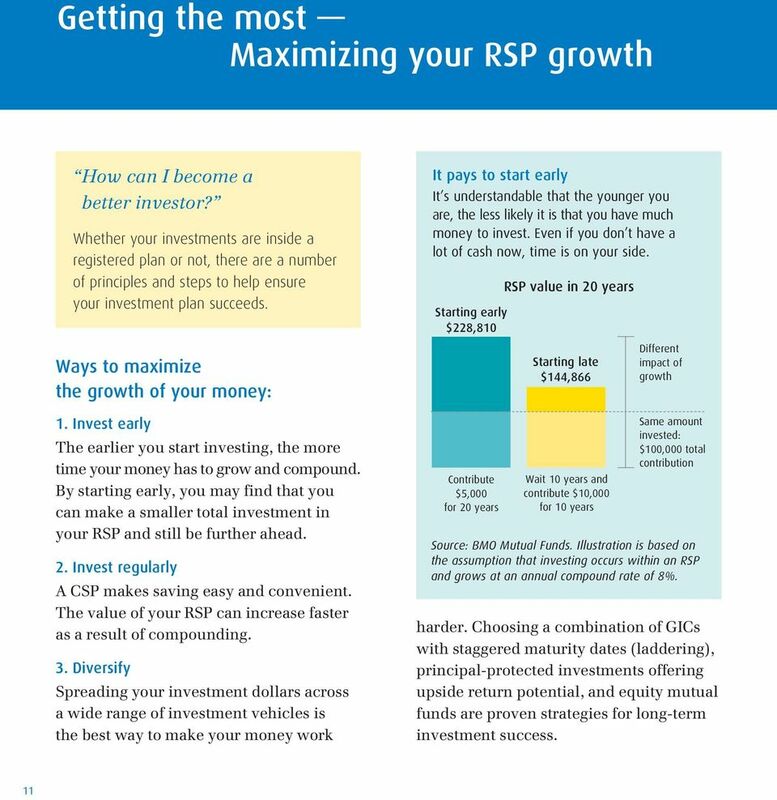 John Wyckoff, CPA/PFS, CFP Your investment priorities are likely to evolve over time, but one goal will remain constant: to maximize your investment returns. Not all returns are created equal, however. 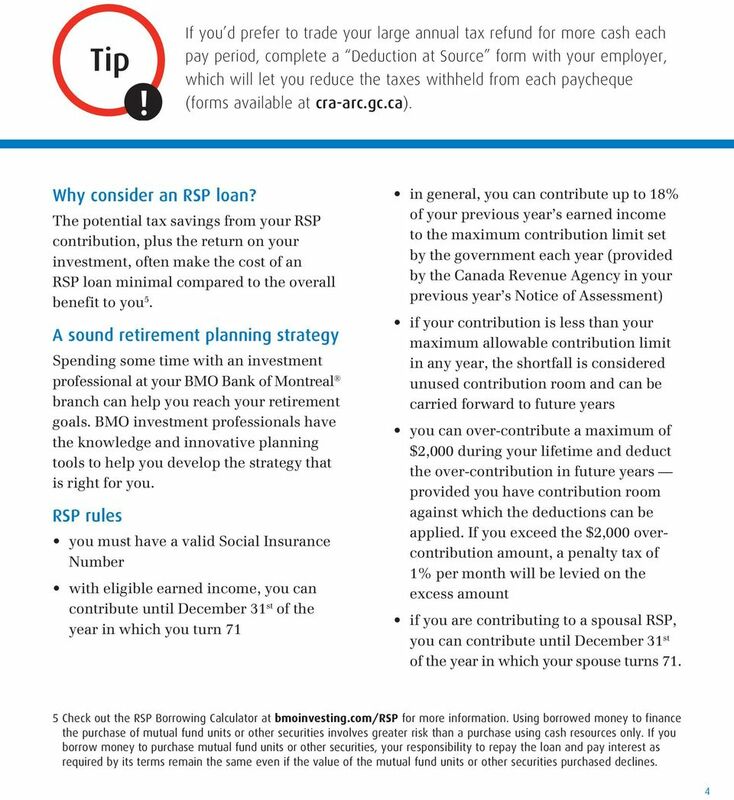 Investing Success: A Silver Bullet or a Disciplined Approach? Assist. Financial Calculators. Technology Solutions. 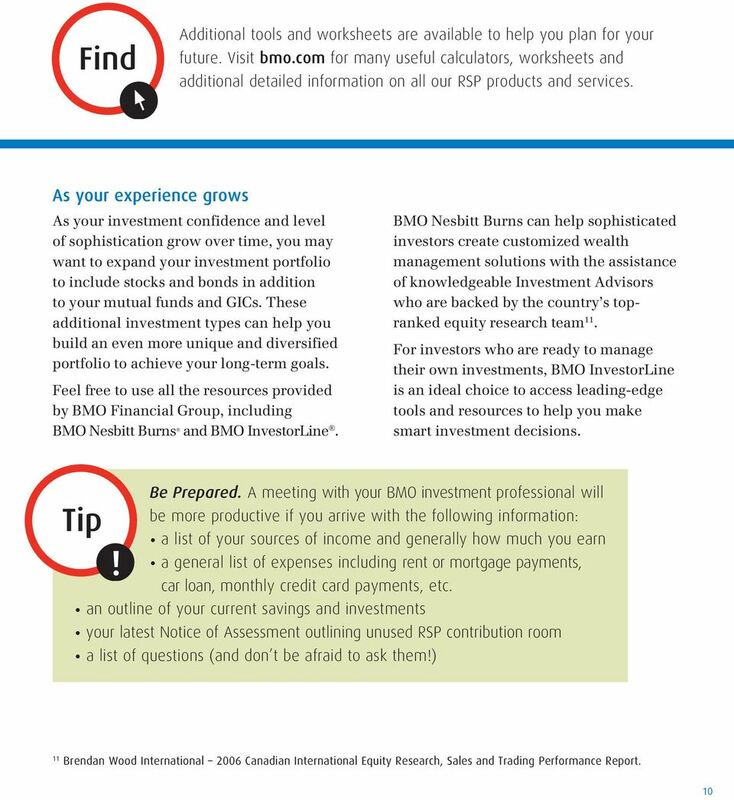 About Our Financial Calculators. 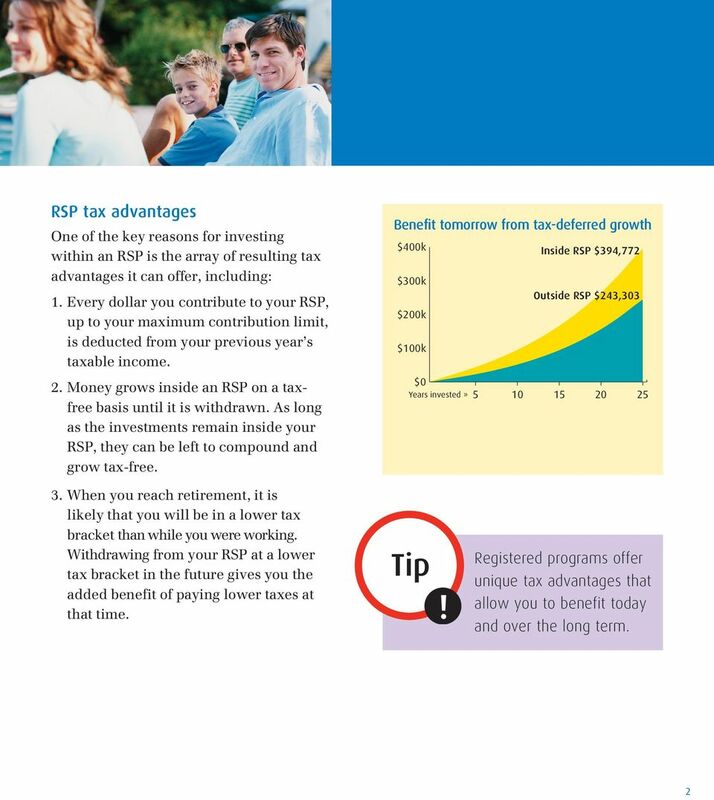 Benefits of Financial Calculators. Getting Answers.